Organic Pea Protein, Cla Oil Powder, Probiotic Blend Ol 10, Golden Flax Seed Powder, Ascorbyl Palmitate, Inulin, Organic Beet Juice, Potassium Citrate, Mixed Tocopherols, Magnesium (as Magnesium Oxide), Vitamin K-1, Vitamin A (as Beta Carotene), Zinc (as Zinc Sulfate), Vitamin B3 (as Niacinamide), Vitamin E, Vitamin D3, Vitamin B-5 Pantothenic Acid, Selenium (Chelate), Biotin, Vitamin B-12 Cyanocobalamin, Vitamin B-6 (Pyridoxine Hcl), Iron Chelate, Vitamin B-1 Thiamine, Vitamin B-2 Riboflavin, Manganese Chelate, Copper Chelate, Vitamin B-9 Folic Acid, Natural Vanilla Flavors, Xylitol, Stevia, and Rice Flour. Add one (1) scoop (40g) of smoothie mix to 8oz of your beverage of choice, along with your favorite fruits and veggies. Blend to make the perfect smoothie! 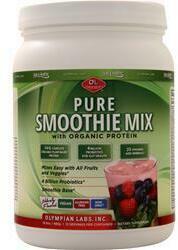 In Addition To Protein And Your Daily Multivitamins, Olympian Labs Pure Smoothie Mix Includes 4 Billion Probiotics! Crafted using the highest quality protein, OLYMPIAN LABS PURE SMOOTHIE MIX is a nutritious blend of CLA, Flaxseed, probiotics, vitamins and minerals. With no added sugar, this optimal smoothie powder is a delicious way to make nutrition simple. Olympian Labs Pure Smoothie Mix starts with an organic, plant-based complete protein powder derived from yellow peas (Pisum Sativum). Pure Smoothie Mix is a great protein source that helps to build lean muscle mass, provides optimum nutrition, and it keeps your hunger more satisfied than other protein powders. Its balanced amino acid profile with BCAAs is great for when you are working out and challenging your muscles. In addition to protein and your daily multivitamins, Olympian Labs Pure Smoothie Mix includes 4 Billion Probiotics. Probiotics are a type of good bacteria in the intestinal tract that aids in digestion and immune functions. Probiotics may help with inflammation and boosting immunity. This nutritious Pure Smoothie Mix also includes CLA and Flax seed for good healthy fats. CLA is a occurring fatty acid found in meat and dairy products. With most Americans consuming less than one gram from their diet per day, supplementing with CLA and Flax seed is a smart choice for anyone trying to maintain a healthy body weight. Flax seed is a rich source of micronutrients, dietary fiber, manganese, vitamin B1, and the essential fatty acid alpha-linolenic acid, also known as ALA or omega-3.